Shaq Fu: A Legend Reborn has managed to secure nearly half a million dollars in funding via Indiegogo. Apparently, the world is more hungry to see a Shaq Fu sequel than we ever thought possible. The Indiegogo campaign to crowdfund an official sequel to the legendarily poor Genesis and Super Nintendo fighting game and Shaquille O'Neal vehicle Shaq Fu has ended comfortably over its $450,000 funding goal. To be exact, it attracted $473,884 in funding from 1,340 backers, a surprising number of whom plonked down the cash for the more expensive reward tiers: hiring Shaq to DJ your party ($35,000); spending an evening at TNT Studio to watch the taping of NBA and have lunch with Shaq ($20,000); dinner with Shaq in Orlando or Atlanta ($20,000); and the opportunity to play basketball at Shaq's house and broadcast the experience online ($15,000). Shaq Fu: A Legend Reborn's developers Big Deez Productions claim that the new game is a not a joke, nor to recapture the "so bad it's good nature" of the original; it's a genuine attempt, developed in collaboration with O'Neal himself, to make a new Shaq Fu game and, in their words, not "fu it up." They claim the new game will be "Streets of Rage meets Street Fighter meets Devil May Cry; a modern-day take on the classic beat 'em up." 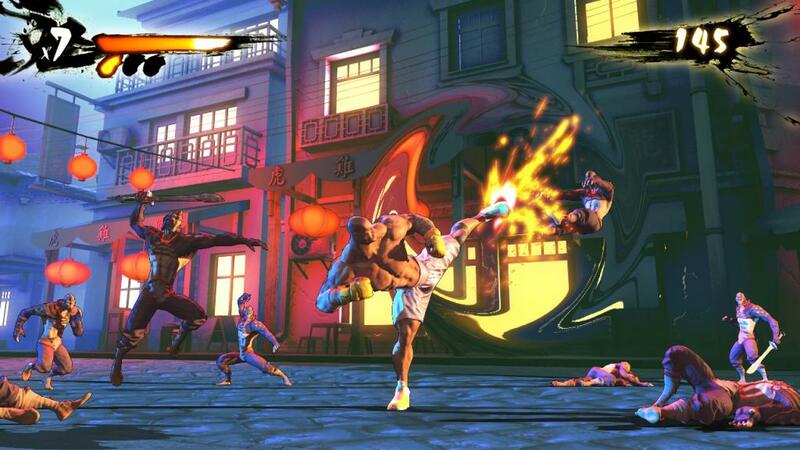 And to be fair, the early screenshots don't look bad at all; the game makes use of an attractive Street Fighter IV-style high-contrast "inked" aesthetic and promises numerous ways to play: cooperative (including split-screen), online and local competitive fighting and numerous challenges to complete using the various playable characters. The game will live or die on whether or not it's actually fun to play; it sounds as if Big Deez's collective hearts are in the right place, at least. The game was originally intended for release on PC only, but since the campaign met its goal of $450,000 it will be ported to all current console platforms -- Wii U, PS3, PS4, Xbox 360, Xbox One -- alongside Windows systems. Find out more here. Tagged with bigdeezproductions,	News,	PC,	PlayStation 3,	PlayStation 4,	PlayStation3,	PlayStation4,	shaqfualegendreborn,	Wii U,	Xbox 360,	Xbox One.